Two months after Apple sued HTC for violating 20 patents, HTC's hitting back, alleging that Apple's violated 5 of HTC's patents, asking the ITC to ban the import and sale of all iPhones, iPods and iPads in the US. UPDATED. So, the story, in a nutshell. A couple months ago, Apple sued HTC over 20 patent violations in its smartphones—particularly its Android phones—basically as a way to swipe at Google. Shortly afterward, HTC announced a patent licensing agreement with Microsoft for its Android phones. (It's paying Microsoft to license technology Microsoft has patents on; which seems odd, given their tight relationship via Windows Phone.) And there's been not a word from Google on any of this. 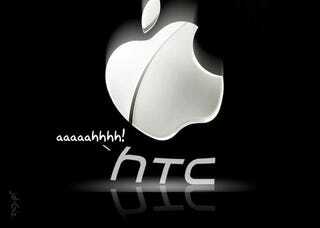 Today, HTC is hitting Apple back over five patents, illustrated above. Two are related to power management, two are over personalized phone dialers, and one's over a telephone dialer with easy access memory—definitely a smaller range of stuff, compared to everything Apple is slamming HTC with.